In Elorus you have the option to change some display settings per document individually, without affecting the defau;t settings that you set in the "Templates" menu. This may be desirable in cases where e.g. the customer is not VAT liable and therefore do not need the relevant information displayed on the document. Once a sales document or estimate is saved, you can click on the "Gear" icon to open the options box (see image below). These options will enable you to modify the document's appearance to better suit your needs. For example, if a VAT tax is not applicable, you can un-select the option on the list. You can choose a different template for this particular document. This will not affect the default template settings of the contact. You can change the content without affecting your template. If you choose this information to appear on the document, the creator's name, email and contact number will appear on it. If displayed, this information will be extracted from the user's profile. If you choose this information to appear on the document, the client’s contact details (name, phone number, email) will be visible. Paid / outstanding amount: Show or hide the paid / unpaid amount for a specific document. These values reflect the due amount at the time of issuing. Client amount due: The client's total amount due. 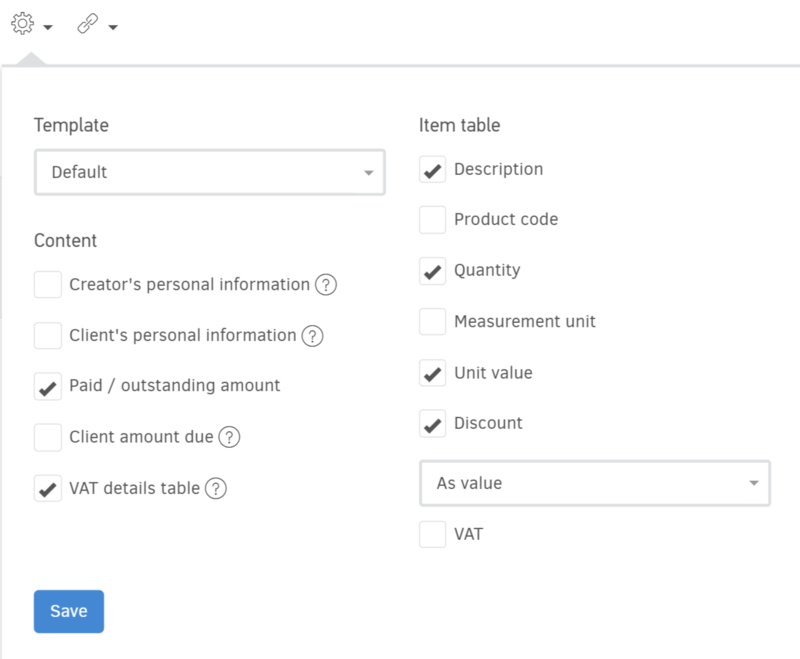 VAT details table: The VAT table analyzes the amounts of each VAT rate found on the document. Measurement unit: Specify if and how you wish the measurement unit column to appear on the document. Unit value: Specify if you wish the value(s) per unit of product(s) column to be displayed. Discount: Hiding the discount column will take effect only if no items are on discount. Can I issue documents in a foreign language?